راستگو, مهدی, رحیمی, حبیب, حمزه ‏لو, حسین حمزه ‏لو, غلامی, وحید. (777). برآورد ساختار سرعت موج برشی و تغییرات عمق موهو در جنوب‏شرق ایران، با استفاده از وارون‏سازی هم‌زمان پاشش امواج سطحی و تابع گیرنده موج P. مجله ژئوفیزیک ایران, 10(4), 112-127. مهدی راستگو; حبیب رحیمی; حسین حمزه ‏لو حمزه ‏لو; وحید غلامی. "برآورد ساختار سرعت موج برشی و تغییرات عمق موهو در جنوب‏شرق ایران، با استفاده از وارون‏سازی هم‌زمان پاشش امواج سطحی و تابع گیرنده موج P". 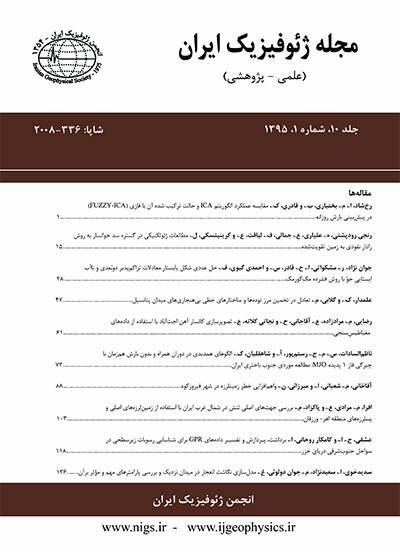 مجله ژئوفیزیک ایران, 10, 4, 777, 112-127. راستگو, مهدی, رحیمی, حبیب, حمزه ‏لو, حسین حمزه ‏لو, غلامی, وحید. (777). 'برآورد ساختار سرعت موج برشی و تغییرات عمق موهو در جنوب‏شرق ایران، با استفاده از وارون‏سازی هم‌زمان پاشش امواج سطحی و تابع گیرنده موج P', مجله ژئوفیزیک ایران, 10(4), pp. 112-127. راستگو, مهدی, رحیمی, حبیب, حمزه ‏لو, حسین حمزه ‏لو, غلامی, وحید. برآورد ساختار سرعت موج برشی و تغییرات عمق موهو در جنوب‏شرق ایران، با استفاده از وارون‏سازی هم‌زمان پاشش امواج سطحی و تابع گیرنده موج P. مجله ژئوفیزیک ایران, 777; 10(4): 112-127. در ناحیه جنوب‏شرق ایران که شامل بخش غربی زون فرورانش فعال مکران است به دلایل مختلفی همچون لرزه‏خیزی اندک و نبود تراکم ایستگاه‏های لرزه‏نگاری دائم، مطالعات اندکی در رابطه با ساختار سرعت موج برشی انجام شده است. هدف از این پژوهش، برآورد ساختار سرعت موج برشی و تغییرات عمق موهو در زیر چهار ایستگاه لرزه‏نگاری نوارپهن ZHSF، KRBR، CHBR و BNDS واقع در محدوده جنوب‏شرق ایران است. برای این منظور از روش وارون‏سازی هم‌زمان منحنی‏های پاشش امواج سطحی حاصل از زمین‏لرزه‏های محلی ناحیه ریگان، به همراه تابع گیرنده موج P حاصل از لرزه‏نگاشت‏های زمین‏لرزه‏های دورلرز ثبت شده در چهار ایستگاه لرزه‏نگاری ذکر شده، استفاده می‏شود. عمق موهو به‌دست آمده از این روش برای چهار ایستگاه ZHSF، KRBR، CHBR و BNDS به‌ترتیب برابر است با 4±38، 6±46، 2±26 و 5±56 کیلومتر. کم‌عمق بودن موهو و نیز بالاتر بودن مقادیر سرعت موج برشی به‌دست آمده در زیر ایستگاه CHBR با فرورانش کم‌عمق لایه اقیانوسی سرعت بالای صفحه عربی به زیر حاشیه جنوبی مکران مطابقت دارد. در عین حال ضخامت زیاد پوسته در محدوده ایستگاه BNDS، در تطابق با توپوگرافی مکان این ایستگاه و نیز برخورد پوسته ضخیم قاره‏ای صفحه عربی با زاگرس در این ناحیه می‏باشد. The southeast region of Iran includes the western part of Makran as an active subduction zone on the North side of the Oman Sea. The velocity structure of this region is not well understood because of its low-level seismicity and a small number of permanent seismic stations in this region. The main purpose of this study is the estimation of shear wave velocity structure and Moho depth variations in the southeast of Iran. To this end, we apply the joint inversion process of Rayleigh and Love waves dispersion curves and the “P-wave receiver function” (PRF) around four permanent broadband seismic stations of the region named ZHSF, KRBR, CHBR, and BNDS. To find the group velocities of surface waves in the southeast of Iran, the “frequency–time analysis” (FTAN) is applied to the waveforms of 40 local earthquakes, which occurred in Rigan region and recorded by the four permanent broadband seismic stations. These local earthquakes include two main shocks of 20 December 2010 (ML=6.4) and 27 January 2011 (ML=6.2) accompanied by their foreshocks and aftershocks in Rigan region. Therefore, the group velocities of fundamental modes of Rayleigh and Love waves are calculated in the period range from 5 to 60 sec in the paths among the four seismic stations and the sources of Rigan earthquakes. Also, to calculate P-wave receiver functions around the four permanent broadband seismic stations, 485 teleseismic earthquakes with suitable signal-to-noise ratios and epicentral distances between 30° and 95° related to the region, are selected. The radial PRFs are computed by deconvolving the vertical component from the radial component based on the iterative deconvolution method (Ligorria and Ammon, 1999). After preparing these two groups of data, we can determine the shear wave velocity structure and Moho depth vicinity of each seismic station by applying the joint inversion process to the dispersion data and the PRF data related to each seismic station (using the joint96 program; Herrmann and Ammon, 2007). Based on the results obtained in this study, the average group velocity of surface waves was estimated at less than 3.5 kms-1 in the period range from 5 to 60 sec. The lowest average group velocity of surface waves was obtained in the paths between the CHBR station and the sources of the Rigan earthquakes. Also, the Moho depths beneath the ZHSF, KRBR, CHBR, and BNDS stations were estimated 38±4, 46±6, 26±2 and 56±5 km, respectively. The minimum thickness of crust beneath CHBR station as well as the higher velocity of shear wave estimated beneath this station, are consistent with the shallow subduction of a high-velocity oceanic crust of Arabian plate beneath the south side of Makran. Furthermore, the thicker crust beneath the KRBR station and the lower velocity of shear wave estimated in this area, when compared with the area encompassing the CHBR station, is due to the existence of magmatic assemblage in the vicinity of the KRBR station. These results are consistent with the crust thickening from the south to the north of Makran. The maximum thickness beneath the BNDS is due to the location of this station being in the southeast of Zagros mountain belt, where the thick continental Arabian plate collides with Zagros. This collision leads to thickening of crust in Zagros. آقانباتی، ع.، 1383، زمین‏شناسی ایران: انتشارات سازمان زمین‏شناسی کشور. شادمنامن، ن.، شمالی، ظ.ح.، میرزایی، ن.، 1390، بررسی ساختار سه­بُعدی سرعت برشی در گوشته بالایی و تغییرات عمق موهو در منطقه مکران: مجله فیزیک زمین و فضا، 37(2)، 153-169. موقری، ر.، جوان دولویی، غ.، نوروزی، م. و سدیدخوی، ا.، 1393، تعیین ساختار سرعتی پوسته جنوب شرق ایران براساس نوفه محیطی لرزه‏نگاشت‌های باندپهن: مجله فیزیک زمین و فضا، 40(2)، 17-30. Abdetedal1, M., Shomali, Z. H., and Gheitanchi, M. R., 2014, Crust and upper mantle structures of the Makran subduction zone in south-east Iran by seismic ambient noise Tomography: Solid Earth Discuss., 6, 1–34. Ammon, C. J., Randall, G. E., Zandt, G., 1990, On the nonuniqueness of receiver function inversions: J. Geophys. Res., 95, 15303–15318. Byrne, D. E., Sykes, A. R., and Davis, D. M., 1992, Great thrust earthquakes and aseismic slip along the plate boundary of the Makran subduction zone: J. Geophys. Res., 97, 449–478. Dziewonski, A. M., Chou, T.-A. and Woodhouse, J. H., 1981, Determination of earthquake source parameters from waveform data for studies of global and regional seismicity: J. Geophys. Res., 86, 2825–2852. DOI: 10.1029/JB086iB04p02825. Ekstrom, G., Nettles, M., and Dziewonski, A. M., 2012, The global CMT project 2004–2010: Centroid-moment tensors for 13,017 earthquakes: Phys. Earth Planet. Inter., 200-201, 1–9. DOI:10.1016/j.pepi.2012.04.002. Farhoudi, G. and Karig, D. E., 1977, Makran of Iran and Pakistan as an active arc system: Geology, 5, 664–668. Herrmann, R. B., and Ammon, C. J., 2007, Computer Programs in Seismology (Version 3.30), SurfaceWaves, Receiver Functions and Crustal Structure: Department of Earth and Atmospheric Sciences, Saint Louis University, St Louis. Jackson, J., and Mckenzie, D. P., 1984, Active tectonics of the Alpine–Himalayan Belt between western Turkey and Pakistan: Geophys. J. Roy. Astron. Soc., 77, 185–264. Kind, R. and Vinnik, L. P., 1988, The upper mantle discontinuities underneath the GRF array from P-to-S converted phases: J. Geophys., 62,138–147. Kind, R., Kosarev, G. L. and Petersen, N. V., 1995, Receiver functions at the stations of the German Regional Seismic Network (GRSN): Geophys. J. Int., 121, 191–202. Kosarev, G., Kind, R., Sobolev, S. V., Yuan, X., Hanka, W., and Oreshin, S., 1999, Seismic evidence for a detached Indian lithosphere mantle beneath Tibet: Science, 283, 1306–1309. Langston, C. A., 1979, Structure under Mount Rainier, Washington, inferred from the teleseismic body waves: J. Geophys. Res., 84, 4749–4762. Levshin, A. L., Pisarenko, V. F. and Pogrebinsky, G. A., 1972, On a frequency-time analysis of oscillations: Ann. Geophys., 28, 211–218. Levshin, A. L., Ratnikova, L., and Berger, J., 1992, Peculiarities of surface wave peopgation across Central Eurasia: Bull. Seism. Soc. Am., 82, 2464–2493. Levshin, A. L., Yanovskaya, T. B, Lander, A. V., Bukchin, B. G., Barmin, M. P., Ratnikova, L. I., and Its, E. N., 1989, Seismic surface waves of a laterally inhomogenous Earth: Kluwer Publ., Dodrecht, 129–182. Ligorria, J. P., Ammon, C. J., 1999, Iterative deconvolution and receiver-function estimation: Bull. Seism. Soc. Am., 89, 1395–1400. Maggi, A. and Priestley, K., 2005, Surface waveform tomography of the Turkish–Iranian plateau: Geophys. J. Int., 160, 1068–1080. Owens, T. J., Zandt, G., and Taylor, S. R., 1984, Seismic evidence for an ancient rift beneath the Cumberland Plateau, Tennessee: A detailed analysis of broadband teleseismic P waveforms: J. Geophys. Res., 89, 7783–7795. Sella, G. F., Dixon, T. H. and and Mao, A., 2002, REVEL, A model for recent plate velocities from space geodesy: J, Geophys. Res., 107(B4), 2081. USGS catalog, 2015, On-line Bulletin: United State Geological Survey, http://www.usgs.gov. Vernant, P., Nilforoushan, F., Hatzfeld, D., Abbassi, M. R., Vigny, C., Masson, F., Nankali, H., Martinod, J., Ashtiani, A., Bayer, R., Tavakoli, F. and Chery, J., 2004, Present-day crustal deformation and plate kinematics in the Middle East constrained by GPS measurements in Iran and northern Oman: Geophys. J. Int., 157, 381–398. Vinnik, L. P., Kosarev, G., and Petersen, N., 1996, Mantle transition zone beneath Eurasia: Geophy. Res. Lett., 23, 1485–1488. Zhu, L. P. and Kanamori, H., 2000, Moho depth variation in southern California from teleseismic receiver functions: J. Geophys. Res., 105, 2969–2980.